We can imagine many people would be shocked to hear we regularly provide chemotherapy to dogs and cats with lymphoma. Here are two case studies which will show how cancers can be successfully diagnosed and treated in dogs and cats. Afterwards we’ll show you some other promising developments in animal cancer treatment. Lymphoma (or lymphosarcoma) is a cancer of the white cells called lymphocytes. It occurs in younger dogs than most other cancers, often in middle age. The classic sign of lymphoma is the appearance of lumps in the neck, armpits and groin. These are enlarged lymph nodes. Sometimes the signs are more vague, like weight loss, poor appetite, lethargy and a fever. There is also a skin-specific form called epitheliotropic lymphoma you can read about here. 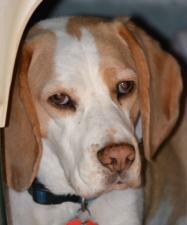 Boston is a beagle who came to us with lumps on his neck. When we examined him we found that all his lymph glands were massively enlarged, and straight away we suspected lymphoma (sometimes called lymphoma). A biopsy performed several days later confirmed this and he was started on chemotherapy. We currently use the Modified Madison Wisconsin Protocol which can be found as ‘CHOP’ on the link. It has been shown to produce the most reliable results and give the longest duration of remission (an average of 12-14 months from start of treatment). The protocol is given over a six month period involving weekly visits (most as outpatients) with occasional weeks off, and periodic blood monitoring. During the protocol, Boston initially had some problems with nausea and vomiting. As the weeks went on we found some strategies to keep his nausea under control and apart from occasional ‘off’ days he responded well to the treatment. In May 2012 his cancer treatment course finished. Since then he remained in remission for approximately three years with the good quality of life of an active beagle. That’s him pictured recently. 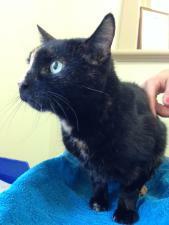 Bunty was a 17-year old cat who came to us with signs of vomiting and weight loss. 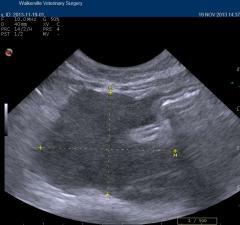 On a physical exam, she looked remarkably good for her age but a lump was found in her abdomen. Blood and urine tests were normal, and so we scheduled an ultrasound examination to better diagnose the origin of the lump. Her ultrasound images showed a large dark mass encircling and compressing, but not invading the stomach (the white part in the middle). The mass was thought to be a tumour acting as a gastric band, preventing the stomach from filling or emptying. There was no other sign of the mass or any other problem in the rest of the abdomen. A needle biopsy performed at the time was inconclusive so we performed a surgical biopsy. The results confirmed it to be lymphoma. After an discussion of the pros and cons of treatment, Bunty’s owners decided to give her the treatment. The protocols we use for cats are not the same as that for dogs, and involve less frequent trips to the vet. We have used two protocols for cats. The older one used by Bunty required visits only every 3 weeks, whereas a newer lymphoma protocol listed here requires fortnightly visits but has a shorter duration. The picture is of her being weighed after two months on the protocol. Apart from one day every three weeks when she would not eat, she was happy and healthy and enjoying life again. Eventually, after a year, her tumour started causing problems again and we advised a humane euthanasia to prevent suffering. Just like in humans, tumours are a significant cause of illness and death in animals. We have many ways of treating them, always starting with surgical removal if possible. Many lumps can be easily removed by including a margin of healthy tissue; if we are concerned about the chance of recurrence we will always biopsy first to plan the excision. Advanced techniques such as skin flaps or grafts can be necessary on rare occasions. It’s vital that you get lumps checked as early as possible to improve your pet’s chances of success. Read more about checking skin lumps here. If an aggressive tumour cannot be removed, sometimes all is not lost. Mast cell tumours can be treated with a new anti-cancer drug Palladia. For many cancers the future looks bright. Some, unfortunately, respond poorly to all treatments. The biggest difference between human and animal cancer treatment is that we can rarely offer a cure if surgery is not possible. Just as importantly, we are acutely aware of our patients’ quality of life. There is no treatment of hopeless cases just because we can, and sometimes we will stop a protocol if the patient is not tolerating it. Pain management is always of paramount importance. What is vital to remember is that no one should feel that they must agree to cancer treatment. We aim for a long disease-free remission period and a happy pet. After all, even if the cancer comes back, they have been given another year or so without having to worry about the future like a human would. Boston’s lengthy remission has been wonderful, but should not be seen as the expectation. 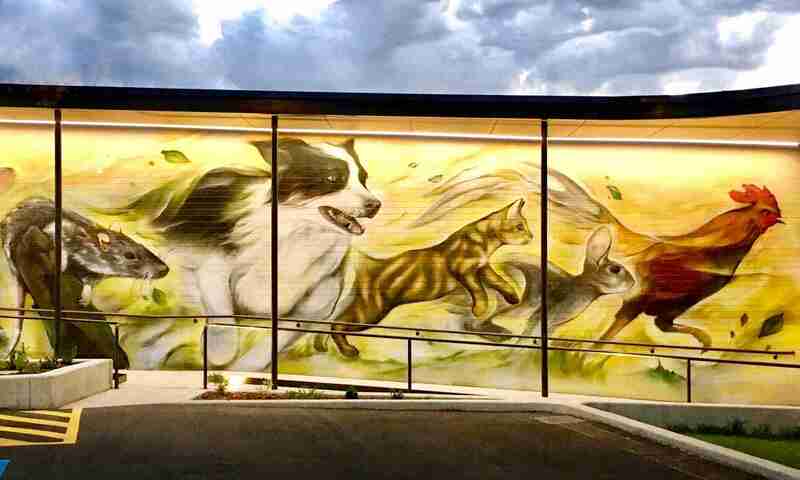 We thank the owners of Bunty and Boston for giving permission to write their stories.